The display also computes the wind chill factor (given wind speed and air temperature), heat index (given outside air temperature and humidity), and dew point (given outside air temperature and humidity). By adding the Depth/Speed/Temperature transducer (DST110) to this system, the true wind speed and direction can be calculated within the display given the boat Speed Through Water (STW). Note that the true wind will be referenced to the boats water speed and not the boats ground speed. 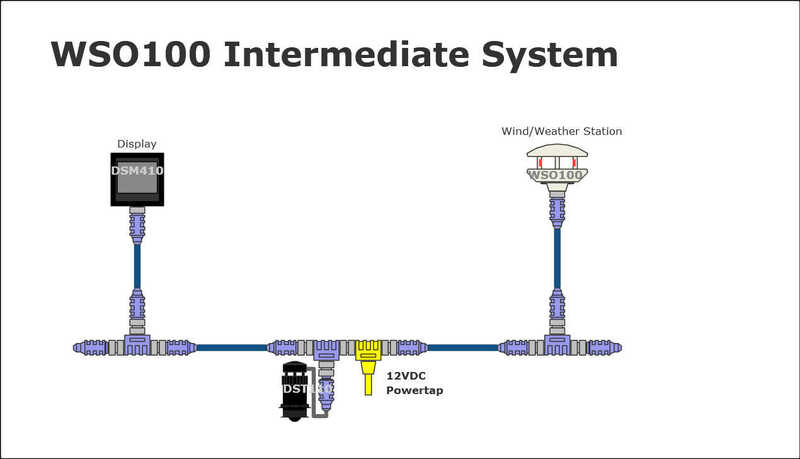 If it is desired to have true wind speed reference to the boat Speed Over Ground (SOG), then you should consider the WSO100 comprehensive system example. WSO100 Wind Weather Station Measures apparent wind speed and direction, barometric pressure, humidity, outside temperature, wind chill factor, heat index, and dew point.